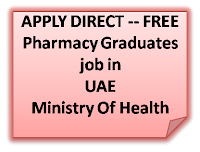 Fresh Pharmacy graduates, or Experienced Pharmacists - It is a dream for most of the Pharmacists to get a job in ministry of health in United Arab emirates. The golden chance to become a pharmacist in MOH United Arab Emirates is here right in-front of you. All that you had to do is to apply DIRECTLY through the link given here below, after " HOW TO APPLY". You must fill in all details and submit your CV. It is highly recommended that the CV must be in MS Word format. Please click here to reach the page to apply directly for the post of GP Pharmacist vacancy in Ministry of Health, United Arab Emirates. Apply directly with all details.